The Australian agency which oversaw the underwater search for missing Malaysia Airlines flight MH370 released two new reports Wednesday. 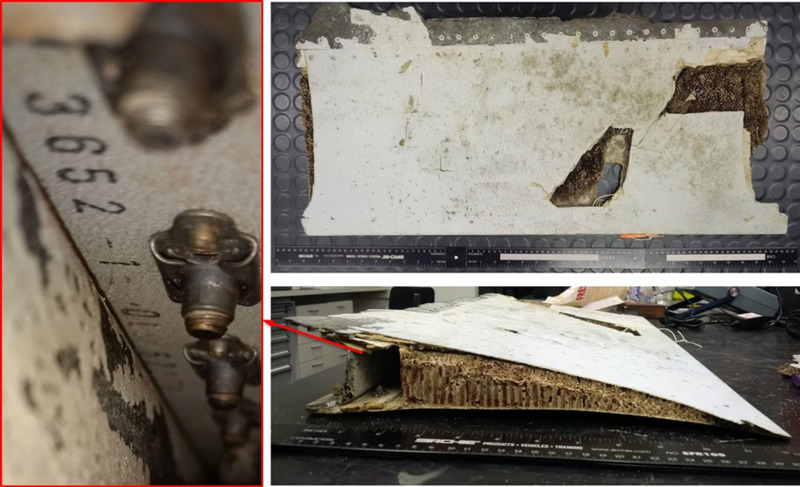 An undated handout combo picture made available on October 8, 2016, by the Australian Transport Safety Bureau (ATSB) shows part of an airplane found washed ashore the island of Mauritius in May 2016. The Australian agency which oversaw the underwater search for missing Malaysia Airlines flight MH370 released two new reports Wednesday, which may help pinpoint where the Boeing 777 disappeared. The underwater search for the missing jetliner, which vanished in 2014, was called off in January after almost three years of searching, but the Australian Transport Safety Bureau (ATSB) and other agencies have continued to conduct drift modelling and satellite analysis. On Wednesday, ATSB chief Greg Hood released a statement alongside two reports from Geosciences Australia and the Commonwealth Scientific and Industrial Research Organisation (CSIRO) which point to a narrower search area for the missing jet. Hood said that Geosciences Australia had analysed satellite imagery from the region in which the jet may have disappeared and found several man-made objects of the bottom of the ocean. He added that while the latest report was encouraging, the object had "not been definitely identified" as from MH370. "We have today released two reports, prepared by Geoscience Australia and the CSIRO," Hood said on Wednesday. "They provide analysis and findings relating to satellite imagery taken on 23 March 2014, two weeks after the disappearance of MH370, over the southern Indian Ocean. "Geoscience Australia identified a number of objects in the satellite imagery which have been classified as probably man-made. "The image resolution is not high enough to be certain whether the objects originated from MH370 or are other objects that might be found floating in oceans around the world. "Clearly, we must be cautious. These objects have not been definitely identified as MH370 debris." Meanwhile the CSIRO's reverse drift modelling has narrowed down any potential new search area to be just 5,000 square kilometers, down from 25,000 square kilometers last year. Hood said that while it was not up to Australia to decide whether a new underwater search should be commissioned, this latest data "may be useful" in informing any further search effort "that may be mounted in the future." MH370 was a scheduled passenger flight bound for Beijing from Kuala Lumpur. There were 239 passengers and crew on board when it disappeared on March 8, 2014.